The Central Coast Business Review’s 2016/17 Investment Prospectus is Available. Sydney’s Central Coast is home to approximately 330,000 residents anticipated to increase to 400,000 in the next 25 years. It forms part of the Greater Sydney Metropolitan Area with a population of approximately 3.Sm people. 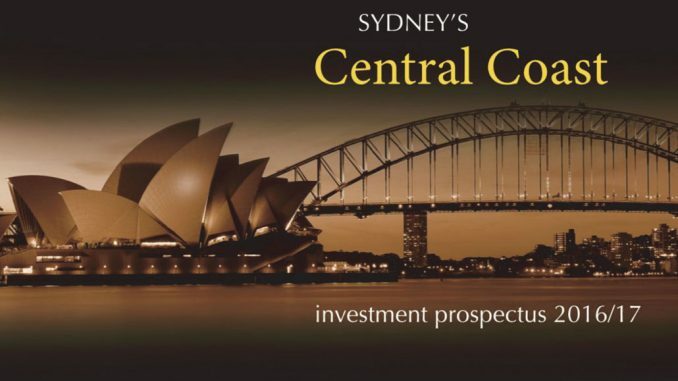 The Central Coast region is situated just over one hour north of the Sydney CBD. It is connected by fast trains into the city (a commuter service accessed by almost 40,000 Central Coast residents daily) and to the Ml Pacific Motorway that also connects the area with Western Sydney. Residential, commercial and industrial properties across the Central Coast offer SOUND REAL ESTATE VALUE for investors, developers and industry. FAST ACCESS to Australia’s major markets and export ports. A large, adaptable and enthusiastic skilled and unskilled WORKFORCE. A well developed INFRASTRUCTURE of roads, rail, electricity, gas, water, sewerage and communication networks that now include connection to the National Broadband Network throughout the region. A flow of NEW INVESTMENT in infrastructure and residential and commercial developments is now well underway across the region. An ideal FAMILY LIFESTYLE in a pristine environment unattainable in the city or comparable areas.